Everyone starts celebrating Christmas in July, so I’m celebrating July in February! *laugh* Today is the February release day for the Essentials by Ellen. I’m sharing a project using the Bear Ware 3 stamp set. I love this set so much!! Nothing makes me happier than dressing up my stamps and this trend of creating stamps that can hold things!! EEEP!! I cut a piece of Neenah Solar White cardstock down to 3 3/4” x 5”. Then I used my Ranger Ink foam blender with Distress Ink in Salty Ocean and the Tim Holtz Falling Stars stencils. I am really into using stencils lately. I like how you can create an even background with them or have them fade around your image. I fussy cut the blue stars for the flag and adhered them over the flag stamped in black. I very carefully fussy cut the fireworks that were stamped in red and adhered them over the sparkler stamped in black. I carefully adhered them in the bear’s hands. I took a piece of the red glitter tape and placed it 3/4 of the way on the cardstock and then used some Lawn Fawn glue to adhere him to the background. Using my Misti I stamped the sentiment below the bear and then adhered the 3 3/4” x 5” to a card base with foam tape. Thanks for stopping by today! 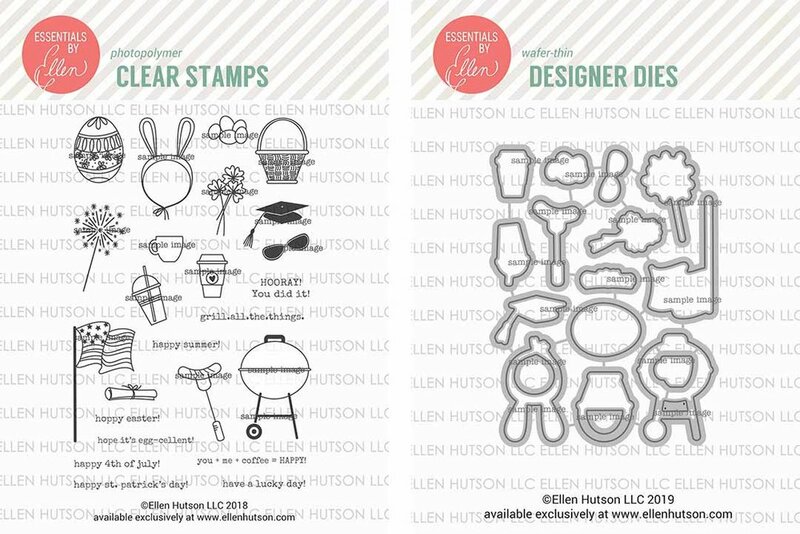 Stay tuned this week as I share more projects here on my blog of this month’s Ellen Hutson release. Happy crafting, friends!